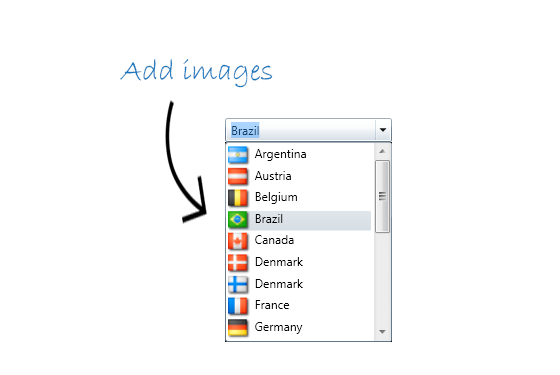 ComponentOne ComboBox™ for WPF is a full-featured combo box control that combines an editable text box with an auto-searchable drop-down list. Locate items quickly by typing the first few characters. ComboBox will automatically search the list and select the items for you as you type. ComboBox uses element virtualization, so it always loads quickly — even when populated with hundreds of items. Configure the drop-down portion of the combo box to display above or below the header portion with the DropDownDirection property. If there is enough space available on the form, you can specify the direction preference to use. Fully customize the content of each item in ComboBox using data templates. This includes text, images, and any other controls. ComboBox has a rich object model. You can easily specify whether the end user is allowed to enter items that aren't on the drop-down list, get or set the index of the selected item, and control how may items should be displayed in the drop-down combo, among other specifications. Because ComboBox for WPF supports ComponentOne ClearStyle™ technology, you can easily change control brushes without having to override templates. 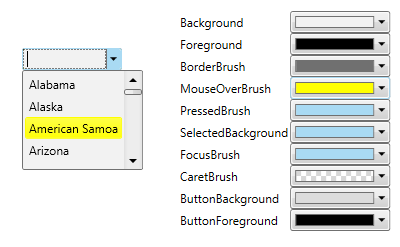 By just setting a few brush properties in Visual Studio, you can quickly style each part of the control.